Get Your Vegan Hotdish On! Join us for a delicious time at the second annual Twin Cities Vegan Hotdish Cook-Off on Saturday, March 22 from 1:00 to 4:00 p.m at the Fuller Park Recreation Center, 48th Street & Grand Ave. S in Minneapolis. Think tater tots, green beans, pasta, and other yummy things all mixed up in a single baking dish. Original recipes from area cooks will be vying for two prize categories: Audience Favorite and Judge’s Pick with additional prizes for the runners up. Our judges are noted cookbook author Robin Asbell, State Fair judge Susanne Mattison, and none other than the the monochromatically stylish Scott Seekins – The Minnesota Famous! Come and support ARC while tasting a variety of delicious hot dishes for only $1 per sample. Free beverages will be provided and there will be lots of great door prizes. Your best Church Lady attire is welcome, but not required. We have a few contestant spots left and a $20 deposit will reserve your spot (you’ll get your deposit back in full at the contest). Contestants will receive a $10 gift card from ARC’s vegan boutique, Ethique Nouveau, and one of our new super secret special event tees! To register to compete, email Dallas at dallas@animalrightscoalition.com. See you there! Speciesism: prejudice or discrimination based on species; especially:discrimination against animals. All around the world wild animals are fighting against humans for their very existence and scientists are predicting a human-caused sixth extinction. Farmed animals are seen only as “stock” without regard to who they are individually, their pain, or their fears. We humans love our “pets” and other animals who have been deemed our “companions” while participating in activities each day that cause other animals to suffer and die. Are we incapable as a species of activating our empathy and taking a fresh look at our relationships with other species?. 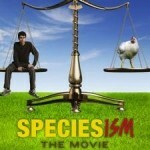 Join ARC and director Mark Devries as we co-host the Minnesota premiere of Speciesism: The Movie at 7:00 p.m. on March 13 at the Lagoon Cinema, 1329 Lagoon Ave. in Minneapolis, and ask Mark anything you’d like at the Q&A afterwards. You’ll never look at animals the same way again—especially humans. Tickets are going fast so get yours now and don’t miss out on seeing this historic documentary. You can watch the trailer here. If you’re looking for a place to connect with other people who care about making the world better for all animals and you’re ready to start taking action to realize that vision, Minnesota Animal Rights Meetup is the group for you. We’re experienced, active, effective,and busy! There are lots of opportunities like leafleting, vegan food sampling, tabling, teaching workshops, reaching out to companies to work with them on changing policies, letter writing, sending furs to wildlife rehabs to help orphaned and injured wildlife—we do it all! 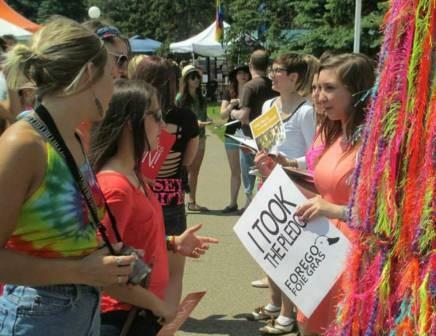 Join Minnesota Animal Rights Meetup (MARC). You don’t have to be vegetarian or vegan to join; we welcome everyone on their journey towards living a more compassionate life. We’ll help you find your niche and get involved in a way that works for you. Thanks to everyone who organized, volunteered, baked, and purchased goodies at the Bake for Their Sake bake sale to benefit our Cuddle Coats program. The sale was a huge success and the volunteers raised over $500 for the program! This Valentine’s Day, ARC is sharing the love by hosting Bake for Their Sake, a vegan bake sale fundraiser for the Cuddle Coats program. Mark your calendars and join us Saturday, February 8th from 1-4 p.m. to get cruelty-free versions of all of your favorite baked goodies, and maybe even find some new favorites! Bake for Their Sake will be held at Ethique Nouveau (ARC’s headquarters and vegan boutique) at 317 W 48th Street in Minneapolis. If you’d like to donate baked goods for the sale, drop off your items the hour before or at the beginning of the bake sale and please bring along the recipes to give out. Funds are being raised to help support the Cuddle Coats program, which accepts donated furs and accessories and ships them to wildlife rehabilitation centers where they are used in the rehabilitation process of injured and orphaned animals such as raccoons, squirrels, rabbits, and chipmunks. The fur is especially helpful when contact with humans must be kept to a minimum, by helping to establish a nurturing and soothing environment and providing comfort and warmth for these animals when one-on-one contact is not advisable. Proceeds from the bake sale will help with the shipping of furs to wildlife rehabilitation centers and will also provide funds for new anti-fur posters. 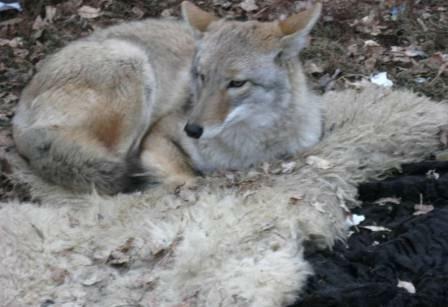 Every year millions of animals are killed for their furs. For those who have decided they no longer want to walk around sporting dead animal skins, ARC’s Cuddle Coats program will take in those furs and give them back to those who really need them: orphaned and injured wild animals. Check out the adorable recipient of a Cuddle Coat, a baby possum growing up strong and secure at Animal Rescue League Shelter & Wildlife Center. During the rehabilitation process, contact with humans must be kept to a minimum. Fur helps establish a nurturing and soothing environment for these animals. Think of the fur as a surrogate parent. The donated furs offer comfort, warmth, and rehabilitation to these ophaned and injured animals before their release into the wild. Animal Ark Thrift Store is one of the local businesses that have taken a pledge not to sell furs in their stores. 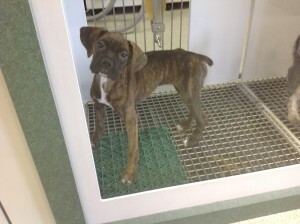 Instead, all furs Animal Ark receives are donated to the Cuddle Coats program. These furs are not sold for profit, but instead are sent to our 22 wildlife rehabilitation partners across the country to be put to use helping wild animals in need. Furs can also be donated at Ethique Nouveau, Everyday People Clothing Exchange, and Earth Exchange. Cookies were flying at the annual Vegan Holiday Cookie Exchange on Saturday, December 14 at Ethique Nouveau. Each person brought 4 dozen vegan cookies and then shared and swapped with others who had done the same. Check out recipes from last year’s cookie exchange and links to recipes from this year’s exchange. It was great seeing so many members and friends at ARC’s Holiday Open House on Sunday, December 8. We enjoyed chatting with all of you about everything ARC has accomplished for animals this year and our plans for an even bigger and better 2014. Helping animals is hard work, but we have serious fun too – so enjoy this oldie but goodie “Animal Rights Coalition Rap” dreamed up by ARC volunteers and performed by Dallas, Ryan, and Aaron. New Shakopee Pet Store Ordinance: Victory or Loss for Animals? Minnesotans may remember the attention given to Shakopee’s Eagle Pet Center pet store when they were featured on the news because their animals were living in deplorable, yet supposedly legal conditions. The media attention sparked an outcry from the community and many local animal advocates who urged the Shakopee City council to adopt a new law that would prevent such rampant animal abuse by pet stores that sell live animals. ARC has been protesting the Petland store in Shakopee for three years through our Minnesotans Exposing Petland campaign. We offered to provide ordinance language used by other cities which would have prevented these types of abuses. But the committee working on the ordinance wasn’t interested. Instead, they chose to include the owners of Petland in their discussions and allow them to help draft the new law, which allows them to continue with business as usual. Keith Streff, cruelty investigator for the Animal Humane Society (AHS) was also in on drafting the new law. 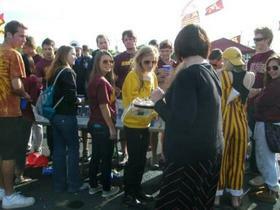 ARC volunteers gave away over 500 samples of vegan burgers, everyone’s game-favorite fare, at two University of Minnesota Gopher football home games in September . For the third year running, Gardein burgers with all the fixin’s flew off the trays as fast as we could grill them. 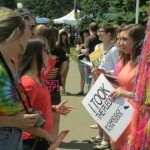 Between the two events, 19 ARC volunteers gave away hundreds of samples plus literature about veganism. The best part is that the game-goers we reached were not likely to have tried vegan food without the encouragement we provided; and they weren’t sorry–we heard many comments about how yummy the burgers tasted. Thanks to all the volunteers who helped with grilling, passing out samples, and answering questions about a plant-based diet.